Our Advanced Kinesiology Tape is a ultra-light, ultra-thin, water resistant therapeutic tape. When applied over muscles following the Advanced Kinesiology Taping Techniques it can reduce pain and inflammation, relax overused tired muscles and support muscles movement by helping to increase blood flow to the affected area. So what makes this tape Advanced? 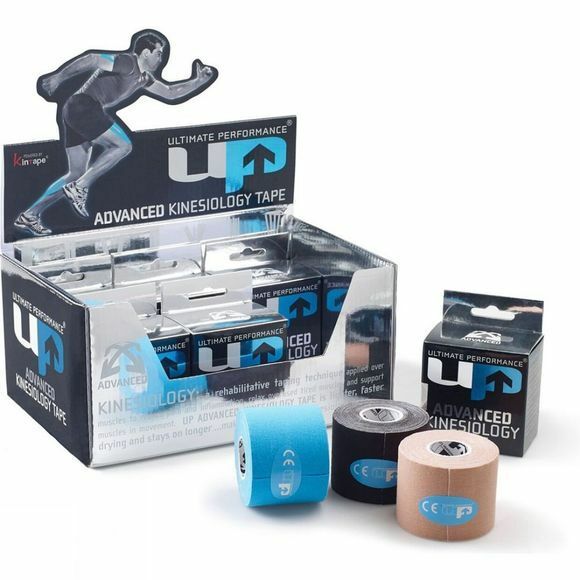 We have researched into what you are looking for in Kinesiology Tape - consistent stretch, longer lasting, shower resistant, less bulk, smoother edges and better adhesive. We have fulfilled ALL of these requirements and the outcome is - The Advanced Kinesiology Tape. Consistent stretch - our Advanced Tape gives you the same amount of stretch each time you use it, not too much and not too little. Improved elastic memory - the tape keeps its tension for the whole time it's on. Superb adhesive (SN/cm), water resistant and fast drying - stays on for up to 7 days, including shower immersions and once wet dries out super-fast. Ultra-light and Ultra-thin - you hardly know it there and with the lowest profile/smoother edges possible means it is less likely to rub or snag on clothing.